(CNN) -- Neither of Dr. Arthur Kellerman's parents wanted to die in a hospital. His father had metastatic cancer and his mother had had multiple strokes, and Kellerman wanted to respect their wishes about the ends of their lives. 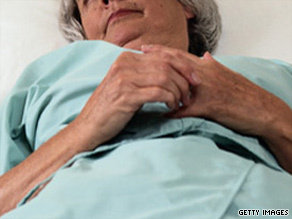 Discussing end-of-life care is difficult for everyone involved, but it should be done early on, doctors say. "Both of them could have ended up dying in a hospital having run up bills of tens or even hundreds of thousands of dollars," said Kellerman, chairman of the department of emergency medicine at Emory University. "Neither of them wanted that, and I fought like hell to keep that from happening." As politicians on Capitol Hill debate reforming the health care system, doctors and ethicists say there could easily be tremendous cost savings if doctors and family members had more conversations about end-of-life issues. Moreover, a 2002 study on 1,185 seriously ill patients at five American teaching hospitals found a large cost associated with a disconnect between what patients wanted and what their doctors thought they wanted. Among patients who wanted comfort care, the average one-year cost for patients who believed their care was not consistent with their wishes was $92,000. Among patients who believed they received the kind of care they wanted, the average cost was $52,000. "Just a few simple words like, 'This must be a very scary time for you. Tell me what your thoughts are,' " can make a big difference, said lead author Dr. Joan Teno, professor of community health and medicine at Brown University School of Medicine. Many aging parents and grandparents resist talking about it because of the emotional pain the issue will cause their younger relatives; and the children who will become responsible don't want to appear ungrateful or self-serving by mentioning it, Kellerman said. Many doctors don't want to talk about it either, he said. "There are a lot of my colleagues who don't bother having that conversation. They just intubate them, and ship them up to an ICU, and say 'next,' " Kellerman said. "Ultimately, it drives up costs, it degrades their quality of life, and you have less money and less resources available for people who really are salvageable and have a whole lot more time left on Earth," he said. In Kellerman's situation, he had to use his knowledge and power as a physician to make sure that "do not call 911, do not send her to the hospital" was written all over his mother's chart so that she would be able to die in her nursing home. Teno's study found that 60 percent of seriously ill patients preferred comfort care, while 40 percent of patients preferred treatment that would focus on extending life. Other studies have shown that many people would prefer to die at home than in a hospital, said Ben Rich, chairman of bioethics at the University of California, Davis, School of Medicine. If told they have six months to live, the number of people who say they would want "full code" orders, which require full-scale lifesaving efforts, rather than do-not-resuscitate orders, drops dramatically, he said. "Patients are able and willing to lower their expectations and reformulate their goals based on the best clinical evidence about their life expectancy," Rich said. But there will always be people who "abhor the idea of dying without fighting to the bitter end," and prefer staying in a hospital, Rich said. Some people have signed advance directives to their children -- legal documents stating what they want to happen in terms of end-of-life decisions -- but don't talk to their children about them, Kellerman said. "You end up with a daughter at two in the morning, and Grandma is in respiratory failure, and we're having a conversation in a family room in the E.R. about what Grandma wants," Kellerman said. "That conversation should have been with that grandmother and her daughter and her doctor and should have happened two years earlier, and it would have been easier on everybody." Beyond the advance directive, doctors need a plan for care with the patient to make sure that the person's goals are honored, Teno said. A problem behind a general lack of communication between doctors and patients is the shortage of primary care physicians in the United States, Rich said. A 2008 study found that the U.S. could face a shortage of up to 44,000 family physicians and general internists by 2025, according to researchers from the University of Missouri. Some medical school graduates shy away from fields such as family medicine, internal medicine and geriatrics because they see how little time they would have to spend with their patients, and how the compensation structure does not reward lengthy conversations with patients. "We need to moderate the system and the style of health care delivery that says you can adequately engage with a patient, determine what their needs are, communicate their plan of care adequately to the patient, and transition to next patient in 10 minutes," Rich said. "Nobody can argue with a straight face that that's reasonable." In Rich's view, changing the way that physicians are reimbursed for dealing with patients -- namely, paying them more for face-to-face interaction with patients -- would help ensure that patients get more appropriate treatment. But what "adequate reimbursement" would be is a matter of debate, he said. In other Western countries, health care professionals earn less in general, and it is unclear whether American society can continue to compensate the medical industry at such high levels overall, he said. Teno advocates for a system of accountability in which doctors are paid extra for having communicated well with patients, and even go without pay for instances where they go against patients' wishes. Currently, the health care system does not reward providers for getting to know patients and practicing "person-centered care," she said. In good health in his mid-50s, Kellerman already has his own advance directive to make sure that his end-of-life wishes are made known when the time comes. "Everybody wants their parents to live forever, everyone wants to live forever," he said. "But the fact is that won't happen, and you do need to think and plan ahead."